A small(and free) 3d fence pack in low poly style. You've died. Welcome to never ending nothingness. Get paid to protect the camp. Upgrade as you go. Some balloons are born to be popped. This looks so fun for couch coop. Just wondering! Thanks. Very responsible of you to add that suicide hotline info at the end. Bite Sized Horror Game Jam 2018 community · Replied to chicabeekaa in Find collaborators! Bite Sized Horror Game Jam 2018 community · Posted in Missing option text in game submission form? Yeah I got that too. I just left them all blank. Bite Sized Horror Game Jam 2018 community · Posted in Find collaborators! looks great! im gonna download them in case ill ever need it! Very nicely done. It took me a while to find the controls are part of the level's artwork. The reason the Black History Month Jam is only 3 weeks, instead of 1 month, is so that we can have a week to play the finished games during Black History Month. I think this was a great idea. Stay relevant! If I don't win, I'm just going to go buy a pizza. I need a pizza. I just wanted to add that I took this devlog, and continued it on my dev blog website. 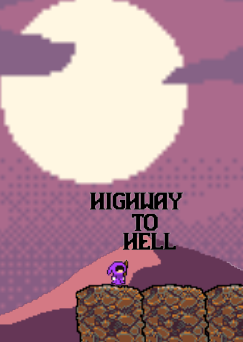 The game is ready to play in your browser! I added ALOT in the last sprint. 3-4 sections that I'm going to call "stages". The game is still one long stage, though. I changed how the first enemy behaves. Added a second enemy, a third enemy. Added a middle boss encounter. Added the Hell Gate encounter with a final boss. And a replay option in case you wanted to try for a better score. It is surprising just how much a few coins will make a stage funner to traverse. I went back and re-coded a lot of the way the controls are handled. I wasn't very happy with the way controls felt. It was hard to land on very small platforms. The first goal of this project is a failure if the controls don't feel good. It still needs a little bit of tweaking but it is definitely a lot smoother than before. The original sprites for the platform tiles as seen in the older screenshots had to go. Their original sizes were way too big. If I wanted to stage to look at least half-decent, I had to use a tileset that was much smaller. I found and started using a new tileset. There are now "coins" as a collectable. They may not stay as coins, but they are serving as a perfect placeholder. It is surprising just how much a few coins will make a stage funner to traverse. The first "stage" is completed and ready to be played. It is pretty easy to complete, with a few alternate routes that you can collect some extra coins. If you look at the GIF in the top of this post, you'll see the character walking back and forth between sign posts. If you haven't guessed it already, those are checkpoints! You can't see what is happening behind the scenes, but it is also setting the player's "respawn" location when you activate the most recent checkpoint. Also, I threw in a pretty nifty audio manager script that I picked up from a YouTube video. So now there a simple and efficient way to play sound effects and music. I've been streaming my development on a twitch channel that I've set up as well. I have no idea how Twitch works as a social network, but I think following will let you know when I'm live? It's just a screen capture with some music in the background. Thanks for the kind words! Hearing feedback helps to stay motivated. I have to say, I am loving the fact that I can prototype with assets. It makes it so much funner. It's hard to find time.. In my last entry, I spoke about avoiding the use of a tile editor. I decided to change my stance. It's just going to look so much cleaner if I use one. Also, clicking and dragging prefabs to build the level will equal or more time. There is now a single enemy that has some basic AI. It will follow the player around and attack when close enough. It has all of it's animations ready to roll out as well. Getting the projectile to shoot out of the "staff" from both the left side and the right side. Getting the projectile to know which direction to face + which direction to travel. Adding the knockback effect took a bit of tweaking. Here is the snippet for how it's done in case you want to do it, too! This pretty much sums up the last of the prototyping. The core mechanics are in place and I can start with a little bit of the production. I went to take a look at what kind of selection there is over at opengameart for picking up some assets. I started to find A LOT of really cool assets that had some potential. Even as little extras to throw into any game. I spent at least an hour downloading everything that looked cool. After organising all of my new found assets, I chose a few that I was going to use in my game. I picked a few tiles and added colliders. I turned them into prefabs. Then, I made shapes out of those tiles, and saved those as prefabs. 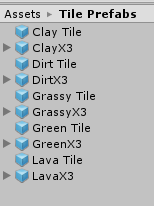 It's a little messier than using a tile editor, but like I said in my goal: this is about saving time. I gave my player sprite some basic movement: Walk left, walk right, and jump. I also added an "attack" that does nothing, but I have the animation for it so it's in there now. That's all I wanted to do for now. I'll start adding in more as the jam progresses. Thanks for tuning in! Keep your eyes peeled. It's go time. Many dangers await you on your journey. 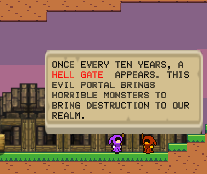 One brave hero is tasked with only one mission: break open the gates to hell. A platforming adventure about crawling through a dungeon filled with nasty threats. Play as a character that is very easy to control. A single stage that should take approx. 5 minutes to complete. I will be using Unity. I have a bad habit of getting caught up in presentation. This usually leads me down a path where a lot of time is wasted. I want to create this game using free, open-licensed assets. i cant believe how something so simple is so addicting. youre literally just watching numbers go up. this game made me do some googling and im shocked to see just how many clicker games there are. I was really expecting a sort of "blob" explosion when i killed a slime. Right now, they kinda just stop moving and leave a stain. The "leaving a stain" is a neat feature, but a death animation would be SOOO satisfying! I gave it "shot". Really cool concept, really clean looking. One thing that kind of made it hard on the eyes was that the mouse+character moved the camera. It can make a person dizzy very quick!